Tropical Storm Issac Update 8-22-2012. 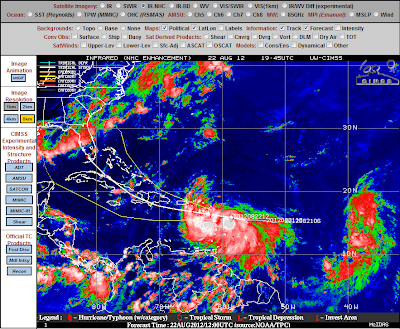 CMISS Visible Satellite Image Of T.S. Issac At 1:45 PM MDT. 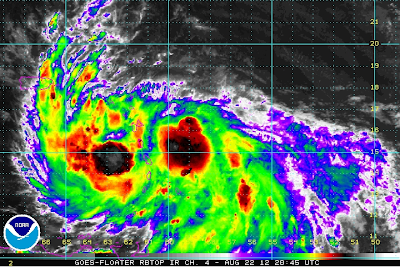 CMISS IR Satellite Image Of T.S. Issac At 1:45 PM MDT. T.S. Issac Visible Satellite Image At 2:45 PM MDT. T.S. Issac IR Rainbow Satellite Image At 2:45 PM MDT. T.S. Issac IR RBTOP Satellite Image At 2:45 PM MDT. 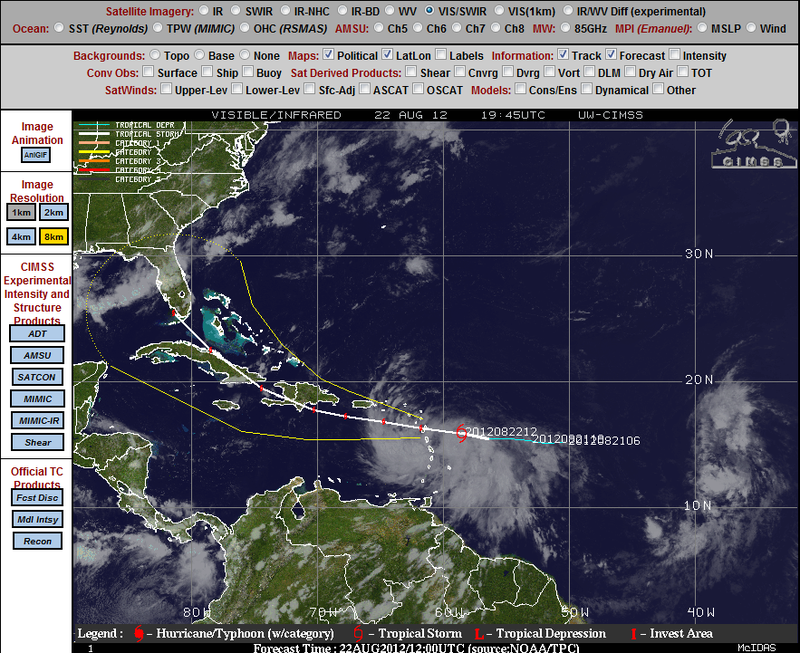 National Hurricane Center (NHC) Forecast Track Of Issac. 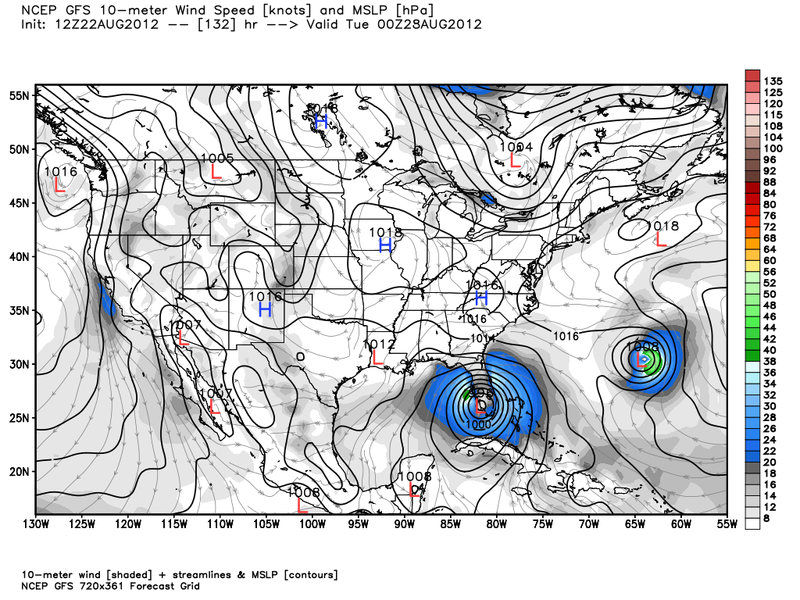 12Z/6 AM MDT Forecast Of T.S. Issac. 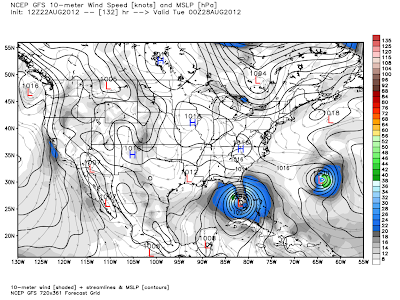 Valid At 6 PM MDT Monday Aug 27, 2012. 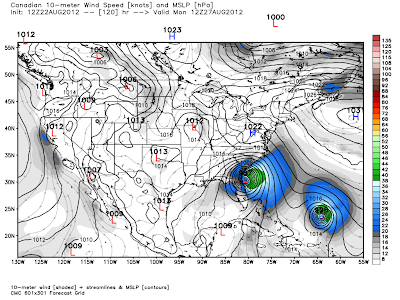 12Z/6AM MDT CMC Forecast Of T.S. Issac. Valid At 6 AM MDT Monday Aug 27, 2012. 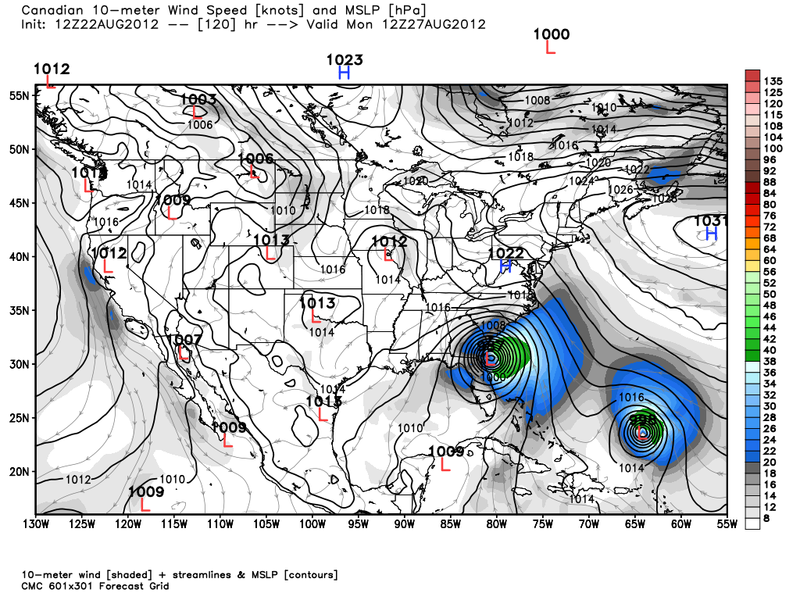 Valid At 6 AM MDT Thursday Aug 30, 2012. Tropical Storm Issac is struggling somewhat this afternoon as dry air to the northeast of the cyclone is getting en-trained into the storm, and disrupting its circulation. 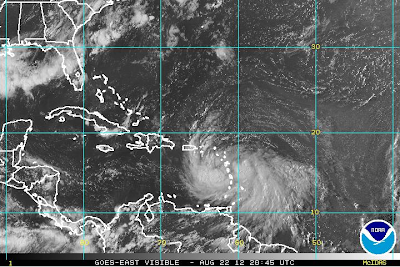 Issac has a broad circulation, with the main center likely southeast of the advisory position. 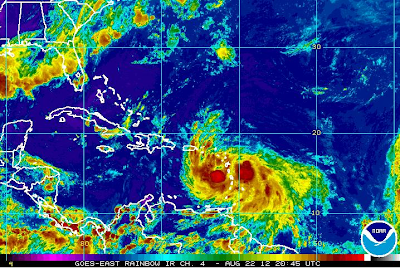 As of 3 PM MDT, Issac was located about 25 miles south-southeast of the island of Guadeloupe. He was clipping along to the west at (a rapid pace for a tropical storm) 22 mph. His central pressure was 29.65 inches of mercury, or 1004 millibars. Issac is still expected to strengthen into a Hurricane within 48-hours. He should continue moving off to the west until Friday, when a weakness in the upper-level ridge, will then allow him to turn more to the west-northwest. As has been discussed over the past couple of days, where Issac eventually heads is the million dollar question. That question for now it appears will remain somewhat unanswered. Officially, the latest National Hurricane Center advisory is forecasting Issac to slide north of Cuba on Sunday, cross the Florida Key's by Sunday night, and move along the southwest to west coast of Florida by next Monday. 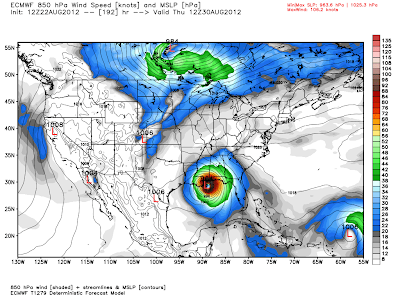 The US GFS forecast model, the Canadian model (CMC), and the European model (ECMWF) , all have different ideas on the eventual track and strength of Issac, which is not at all that unusual when forecasting Hurricanes. If Issac moves south of the Dominican Republic and Haiti, and then enters the central Gulf of Mexico as the ECMWF model is forecasting, look out New Orleans and nearby areas. Should Issac get hung up along the mountains of the Dominican Republic and Haiti, then his circulation will take a beating, and he could be a weaker storm when he threatens Florida, as the CMC and GFS models are suggesting. There certainly is the potential for Issac to possibly become a strong, perhaps even a Major Hurricane, especially if he tracks further westward like the ECMWF model is forecasting, and enters the Gulf of Mexico, and encounters some very warm waters. Nothing is written in stone this early in the game. 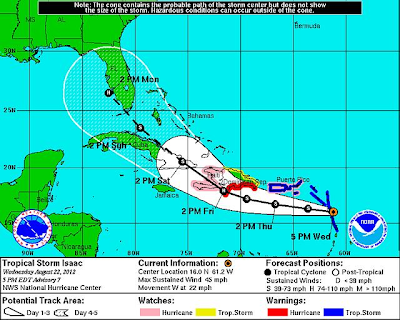 So if you have family and friends living anywhere along the Gulf Coast, or the Eastern Seaboard, please ask them to stay abreast of all of the very latest National Hurricane Center updates concerning Issac this weekend, as well as next week. To throw a monkey wrench into the mix we may have yet another tropical cyclone (now known as Tropical Depression #10) following hot on the heels of Issac next week, which would be name Joyce. If thought this was going to be a boring season, then perhaps you have figured out by now that you may have been wrong. Keep checking back, its liable to be a very busy and interesting weekend and week weather-wise. Thanks for stopping by.